Contents: 250 tabs each containing 1010mg of Hydrolyzed Super Collagen™ Type 1&3. EnergyBalance Hydrolyzed Super Collagen™ Type 1&3 is the most important structural substance in the human system, supplying up to 30% of the body's total protein needs. As soon as we turn 26, our bodies start to lose around 1% of its collagen per year. That changes the structure of our skin and we develop more wrinkles. Collagen comes in an enzymatic amino acid form with a very low molecular weight that is fully absorbed by the body. 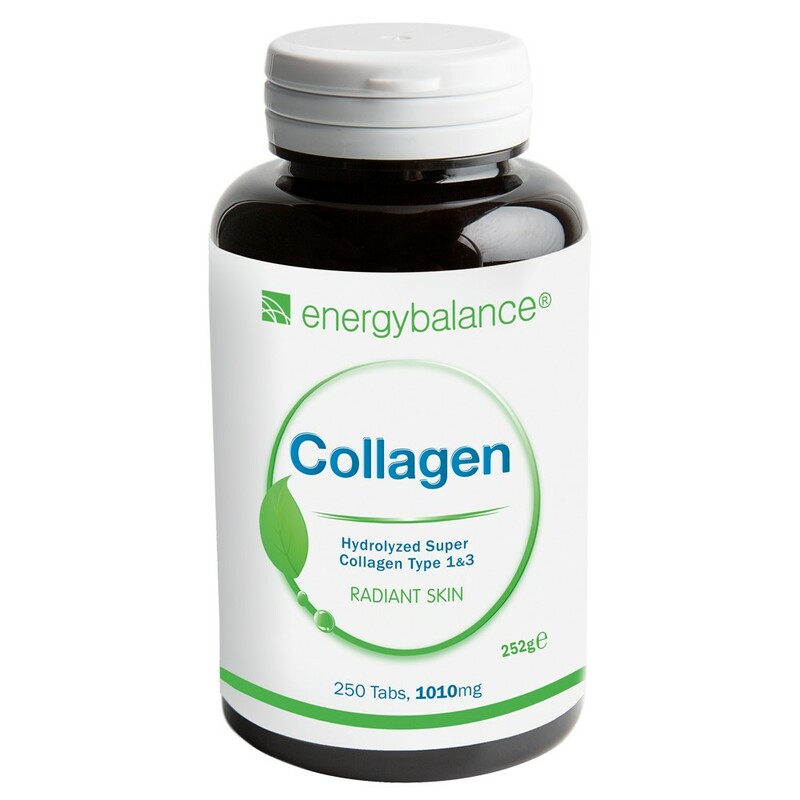 Collagen is a complex structural protein that mantains strength and flexibility throughout the body. This collagen is made up of the collagen peptides TYPE 1&3 wich support collagen skin, hair, nails, muscles, tendons, ligaments and bones. This collagen is enzymatically hydrolyzed, providing an amino acid ratio with a low molecular weight for maximum bioavailability and utilization by the body. When eating this collagen, the body receives the raw materials it needs to supplement the collagen found in all of these areas and may act as a messenger to trigger the synthesis of new collagen fibers. It works synergistically with vitamin C.
252g = 250 tabs each containing 1010mg of Hydrolyzed Super Collagen™ Type 1&3 from pharmaceutical food grade bovine collagen, Vitamin C calcium ascorbate. May cotain vegetable magnesium stearate (as anti-caking agent). Allergen info: may contain sulfite residues.